Winter weather's strong presence in late February and March has some producers in Illinois scrambling to stretch already limited feed supplies. The best way to stretch feeds is to reduce waste. All feeding strategies have some waste involved. Waste can occur in feed preparation, feed storage, and of course at feeding. By now, improvement must come by decreasing waste at feeding. Feeding hay is the most popular way of wintering cows in the Midwest. Unfortunately, feeding hay is associated with high amounts of waste. 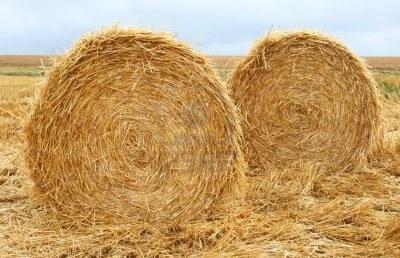 Feeding hay without a feeder can result in up to 40% waste. The most popular feeder in the Midwest is the ring feeder. Improved ring hay feeder designs have shown to limit hay waste and save you hay. Utilizing these feeders can help you stretch your hay supplies. If your main forage is corn silage, then limit-feeding may be a strategy to stretch it. If cows are lactating, limit-feeding corn silage will need to be supplemented with a few pounds of grain or co-products. It is also important to point out cows will not feel full and are more likely to pressure fences. Some producers that have poor quality forages like straw or cornstalks can include those feedstuffs in a balanced ration to add filler. If you are in a position where you need to purchase additional feeds, look into corn co-products like DDGS and CGF. Soyhulls are also an option. These "by-product" feeds will be cheaper than feeding corn and other grains. Some producers have asked about buying protein tubs. I recommend that protein tubs not be used as a substitute for lack of feed. Protein tubs are best used to increase forage utilization, not replace the lack of forage. Protein tubs cannot supply enough protein and energy. They are designed for low intake. If forage/feed is limited, producers need to get more nutrition down cows than a tub alone can provide. Consult with your nutritionist to ensure cow requirements are being met. A little feed or management of feed can pay large dividends when breeding season approaches. By the way if you are breeding for Jan. 1 calves... Cows will be need to be bred the end of the month... only a few weeks away! Cows that are in thin condition and cows that are losing weight have poorer conception rates. Mother Nature is testing us with some cold, snowy, wet, winter weather. It is important to monitor and maintain adequate nutrition, because it has a huge impact on reproduction.